The very picturesque courthouse in Maffra, Victoria. If you’re planning on making a trip Down Under, know this – you’ll only be rewarded if you get off the beaten path and spend time in some small towns in Australia. Our capital cities are very lovely indeed, but many would argue that the heart of the country lies in its country and beachside towns. Each come with their own little quirks, whether it be beautiful beaches, historic architecture, kooky festivals or fabulous gourmet food and wine. 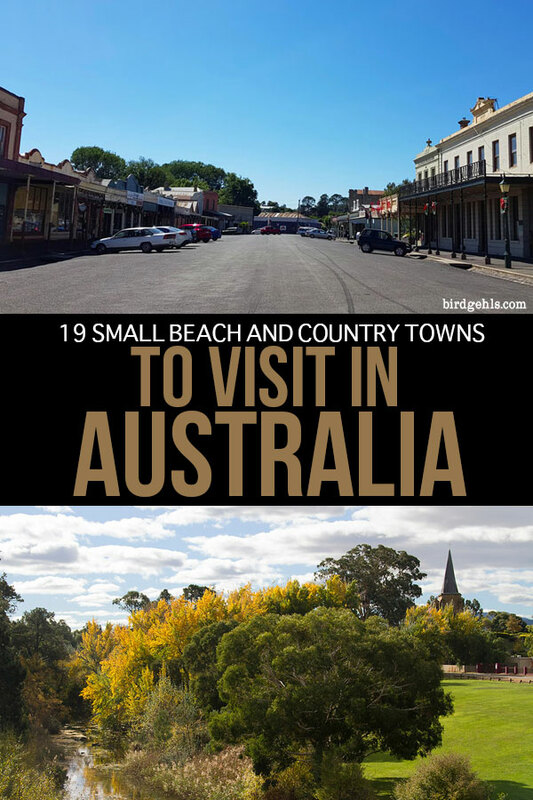 With the help of some other travel bloggers, I’ve put together this list of nineteen towns to visit across Australia, helpfully (I hope) categorised by state. Some are teeny tiny and others are maybe slightly bigger than small, but still delightful in appearance. 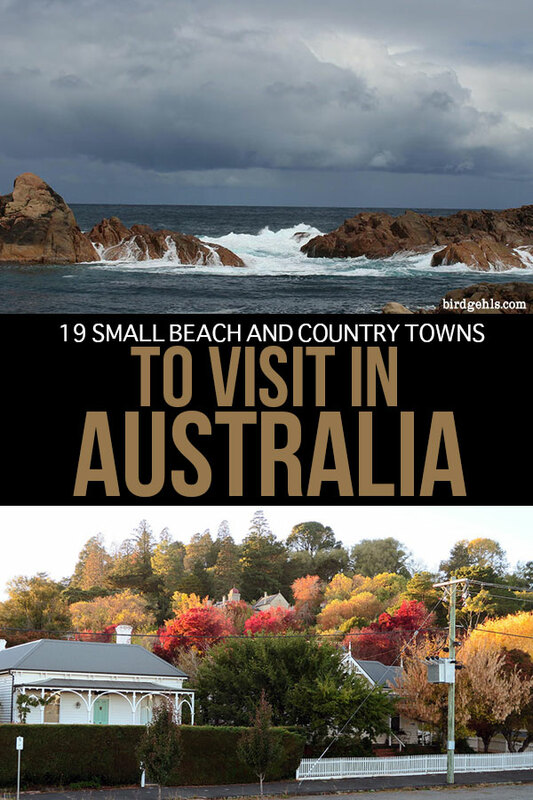 These towns should cater to every traveller – whether you’re after the best country towns, or the best beach towns in Australia. 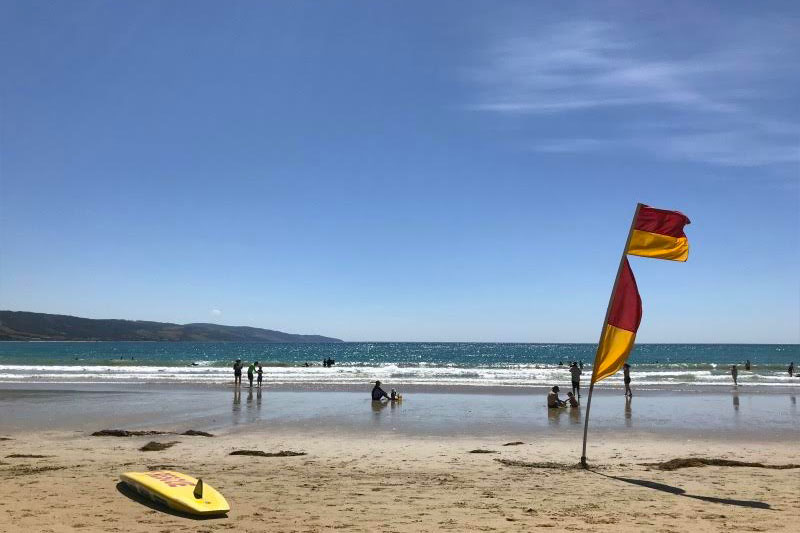 A beautiful day at Apollo Bay. Beachside Apollo Bay lies smack bang in the middle of the Great Ocean Road in Victoria. This spectacular drive is supremely popular with locals and travellers alike. With famous surfing destination Bells Beach at one end and the magnificent Twelve Apostles close to the other end, there’s plenty of natural beauty in this part of the world. Apollo Bay makes for a central base to explore the region, as well as being a cute little town in itself. The endless beach is the main attraction and quite rightly so. The majestic beauty of the crashing surf invigorates the soul. Plus there’s a patrolled section for safe swimming. 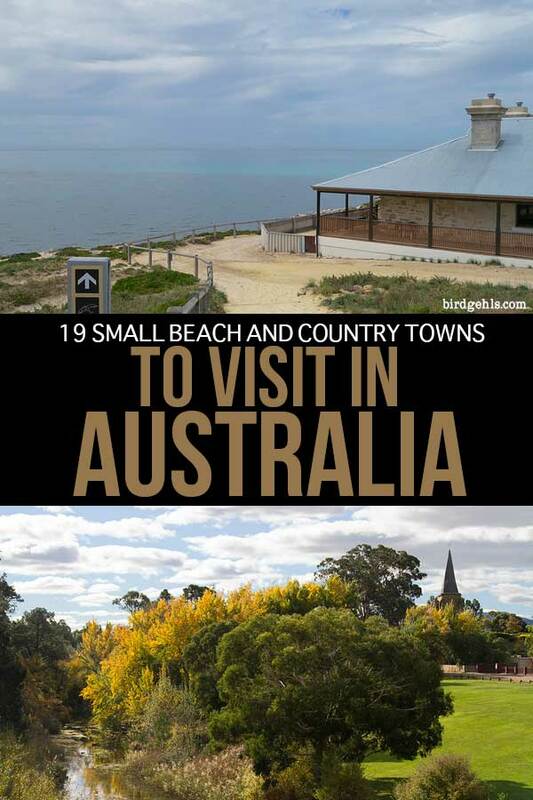 This is one of the larger towns along the Great Ocean Road, so you will find a range of accommodation, from Airbnbs with ocean views, to budget-friendly caravan parks and motels. Great coffee can be found at Café 153 and the scallop pies at the Apollo Bay Bakery are legendary. Even if you don’t stay in Apollo Bay, make sure you stop off for lunch! If you have a few days, there’s plenty to do. Take a drive to the Twelve Apostles and Loch Ard Gorge. It’s about a 90 minute trip and these attractions get very busy, so get an early start to beat the day trip buses coming down from Melbourne. On your way back explore the historic Cape Otway lighthouse. Closer to town are the tranquil walks and waterfalls in the Great Otway National Park, and the Otway Fly Treetop Walk allows you to get in amongst the gumtrees. Read more about driving the Great Ocean Road here. Thanks to Escape With Kids for the submission! Clunes is so picture perfect, it’s a popular setting for movies. Clunes is truly Victoria’s most historic town. 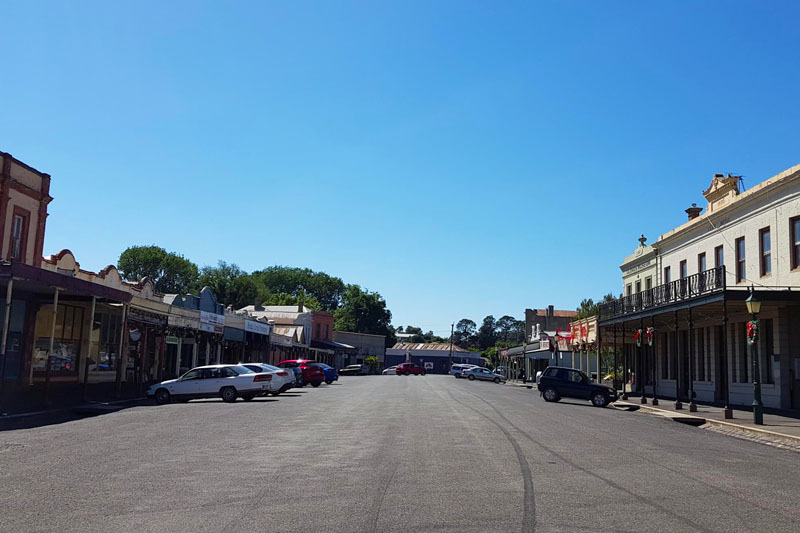 Take a walk through the main street and you’ll be taken back to the 1850s – a time when gold was first struck, and miners the world over embarked upon the town and surrounding regions of Ballarat and Bendigo in an attempt to strike it rich. The town is located 140km (100 minute drive) outside Melbourne, making it a perfect stop when exploring the gold field region for the day. But gold is not only what Clunes is about. It’s the host of the annual – and biggest book event in Victoria, “Book Town”; which draws hundreds of thousands of visitors nation-wide to the town for one weekend. 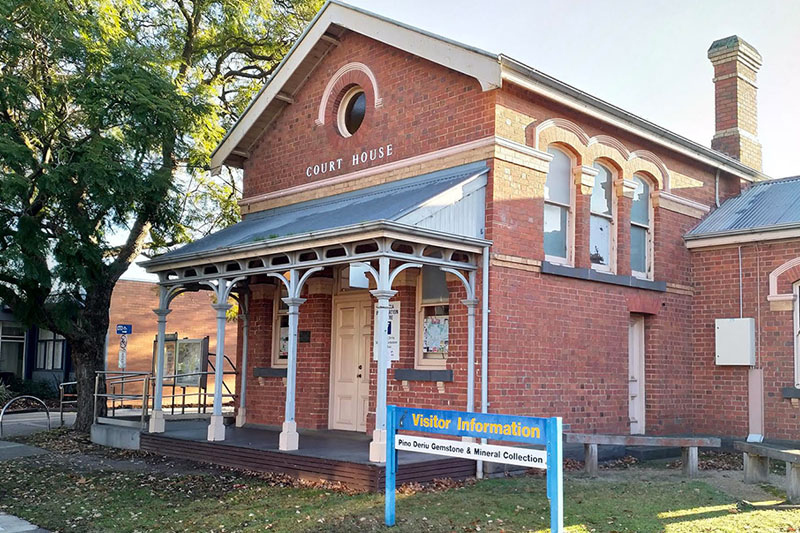 Clunes is also a film lover’s paradise, with countless Aussie films and television shows having been filmed right here – including the film which launched the career of Mel Gibson “Mad Max”, and Bushranger biopic “Ned Kelly” starring the late Heath Ledger. It continues to be a film backdrop even today. I love this town. It is my second home given my grandmother lived here for 30 years, so I cannot recommend it more. Do not miss out on seeing it if you’re exploring the gold fields and country Victoria – you won’t regret it! Thanks to Enchanted Serendipity for the submission! 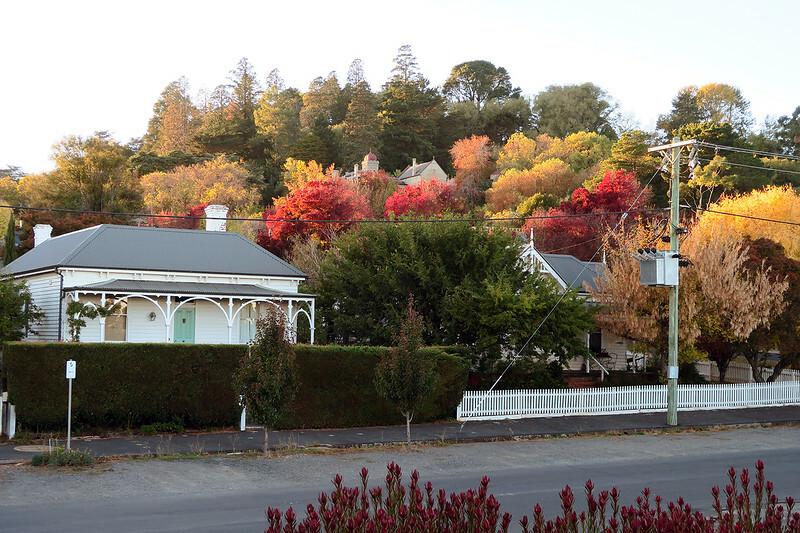 Journey to Daylesford in the autumn months to catch some gorgeous foiliage. Many cities or towns that you visit leave you more tired or stressed than before. One place that isn’t like that is Daylesford. Daylesford is in the centre of Spa County in Victoria and has a plethora of things to do to ensure a relaxing break. Surrounded by natural springs – a great (and free) activity is to walk through the Mineral Springs reserve and fill your bottles with fresh mineral water – direct from the source. After this take advantage of the healing and restorative powers of the water by heading to the famous Hepburn Bathhouse – open since 1895. Here you can bathe in warm natural springs before indulging in the long menu of treatments and massages designed to make you feel better. Once you are feeling relaxed its time to try some of the local natural produce. The local farmers market offers a range of high quality local products, this is a great stop before heading onto Daylesford Cider. Here you can enjoy one of their organic apple ciders in the beautiful gardens or on a cold day enjoy some live music by their open fire. Editor’s note: Here are some tips for planning a weekend getaway to Daylesford. Big thanks to Globe Talking for this contribution! Maffra is one of those small non descript towns that lives just off the Princes Highway in Gippsland Australia. A little town with a popultaion of around 5000 had been our home for my entire life. Maffra is a dairy town and home to what was one a Devondale Milk factory ( its recently been wound up and sold to a Canadian multi-national). Maffra is famous or well known for 2 things. The first one is the Maffra Pie. The Maffra Pie is sold all over the Gippsland region in takeaway shops evereywhere. The Maffra Pie is the finest example of a soft but tasty pastry filled with quality mince and gravy. The Maffra Bakery have been turning these beauties out for over half a century. I must say the Pastie is also a treat to behold and in some circles is know as the Maffra Roast. The second thing Maffra is know for is the Gippsland Vehicle Collection. Like most great Aussie ideas The Gippsland Vehicle Collection was developed by 3 mates and 1 pub. Today the Gippsland Vehicle Collection welcomes cars and visitors for all over Australia. The Shed as its locally known changes its collections of cars regually and hold motor show all year around. The Gippsland Vehicle Collection has been awarded many local tourism awards and has a 4 star rating on Trip Advisor. Maffra is known for its beautiful tree lined main street. A stroll along the main street taking in the small shops or drinking a latte at any of a number of cafe’s in town. Submitted by Travels in Gippsland! Australia’s iconic Great Ocean Road. Lorne is a vibrant little town along the well-known Great Ocean Road drive in Victoria. It gets very busy in the peak tourist season as many Melburnians head down there on day trips. Go out of season, though, and the town is totally different, it still has a buzz and all the shops will usually be open all year round. There is a really good information centre in the town and a historical display about the building of the Great Ocean Road. Some of the images are incredible, showing the ingenuity of the workers in digging out rocks from the cliff face in the most hazardous sections of the road. For me though, the drawcard is the stunning beach and the forest that comes all the way to the town itself. 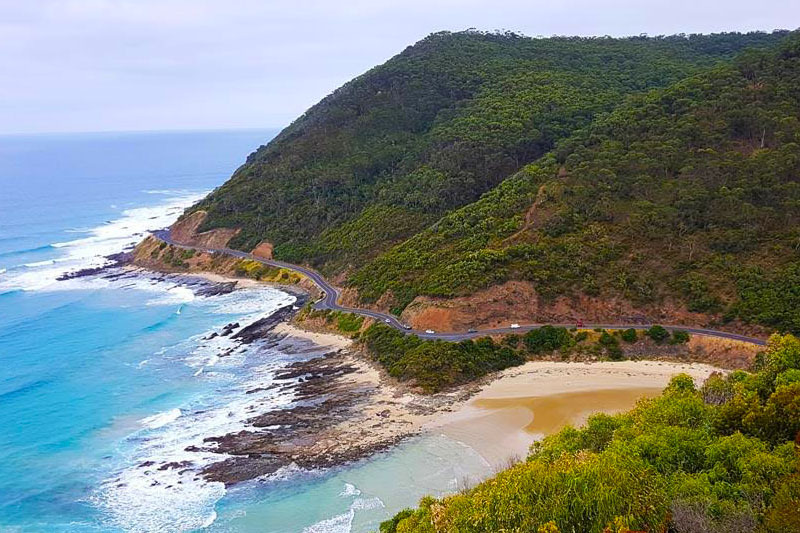 The views from Teddys Lookout, on the edge of Lorne, are gorgeous as they look down on the winding ocean road and out to the ocean. Koalas can often be found in the manna gum trees along the walk too. My favourite walk from Lorne (usually after lunch at my favourite eatery Cafe Kaos) is the walk to Erskine Falls. It starts from near the supermarket and takes about 3 hours return covering less than 8 kms. They are one of the prettiest waterfalls in Victoria and Lorne is such a great base for walking to the falls. Read more about Lorne and the coastal drive on Explore The Great Ocean Road. Looking out across the bay (source). Situated less than a 3 hour drive north of bustling Sydney, you can find one of Australia’s best kept secrets. 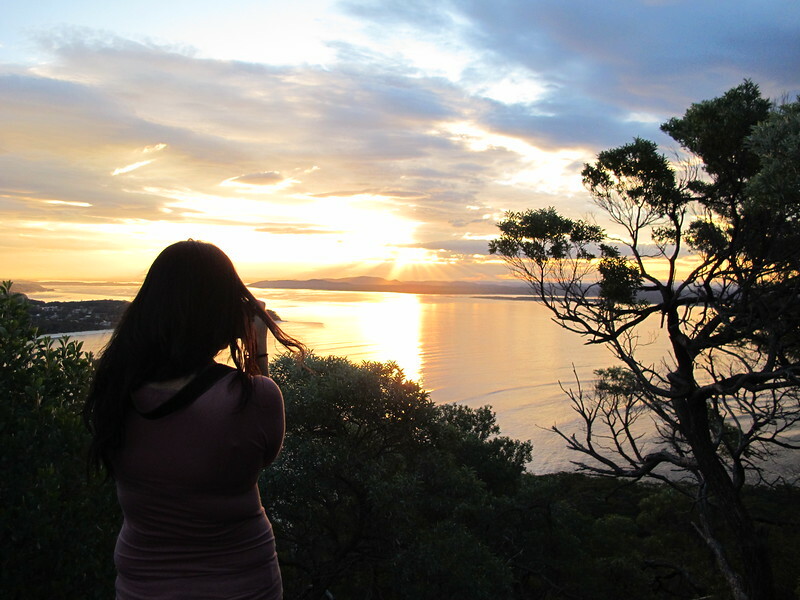 A popular weekend destination for Aussie’s, but still untouched by the hoards of backpackers making their way up and down the coast, Port Stephens is a beautiful area that needs to be experienced! This small peninsula is home to some stunning beaches, and you can easily find a quite place away from the crowds. Stockton Sand Dunes run from nearby Newcastle all the way along the coast of Port Stephens. These 32 km long dunes are the longest shifting sand dunes in the southern hemisphere, and can be explored by 4WD, or by a sand boarding tour. If you enjoy walking, at low tide you can walk across the exposed sand of “Fingal Spit” and check out the lighthouse. Another hike not to be missed is nearby Tomaree Head, a short but steep walk to the summit, where you will be rewarded with panoramic views of the area. If you are lucky, you may see the tell tale plumes of water from migrating Humpback Whales. If marine life is of interest, then down in Nelson Bay you can board a Dolphin watching cruise. The boat will take you out of the bay, and give you spectacular views of the coastline as well as a near 100% chance of seeing the resident dolphins. 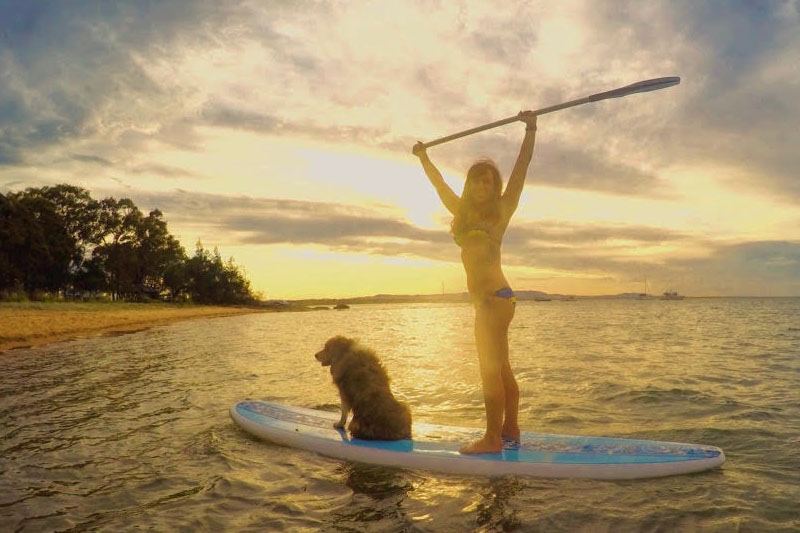 If you are more adventurous, there are plenty of places you can rent a surfboard, stand up paddle board or kayak. Editor’s note: Read this guide about beach safety in Australia, before heading into the water. Submitted by Around the World With Her. This is a view worth toasting a glass of wine to. When I first settled in Sydney, I quickly sought out to discover the surroundings, and quickly found many places perfect for a relaxing weekend. Sydney is a sprawling metropolis, and it’s good to get out of it for a little while. Gradually, I pushed out further and further, until my curiosity took me to the outback, past Bathurst. Mudgee is a lively and growing small town north west of Sydney. A three and a half hour drive through the Blue Mountains and the Western Plains, Mudgee is surrounded by hills and home to a thriving wine industry. Unlike the Hunter Valley, Mudgee’s wineries are family-owned, which give them a very welcoming feel. I really love discovering new wineries and meeting passionate winemakers. Mudgee also has great food, with some fantastic restaurants, in town or in wineries. The town has attracted real talent in that space and some locals have really embraced a sustainable food culture. Mudgee is a weekend destination that caters to all kinds of travellers, with a wide range of accommodation choices. I always go for a cosy B&B on a hill overlooking a valley, however there are many options around town. If you are looking to indulge in food and wine while getting away from the hustle and bustle of Sydney, Mudgee is a great choice and will give you the hospitality you can only find in an Australian small town. Here are 6 reasons why you should escape away to Mudgee, just in case you need further convincing. 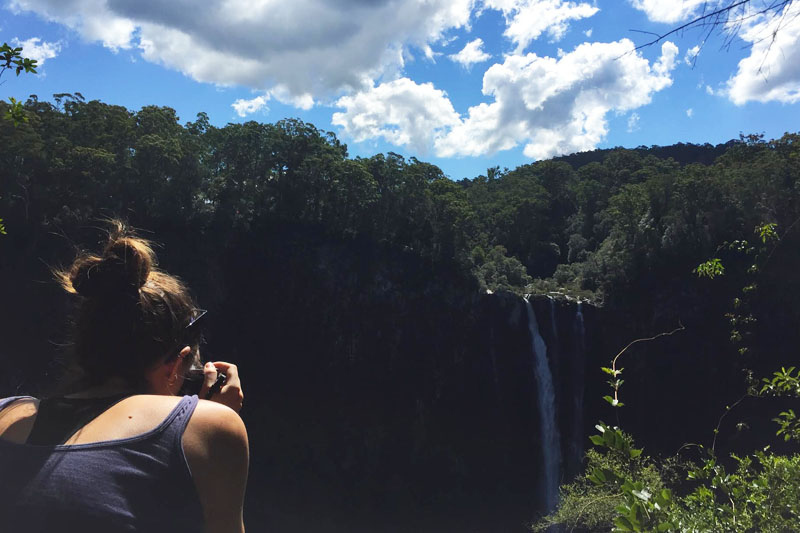 This tiny mountain town is probaly best known for their gorgeous waterfall; Ellenborough Falls. At 200 metres it is one of the longest single drop waterfalls in the Southern Hemisphere. Stop at one of the many lookouts of the falls during the trail down and you can view for yourself why this is one of the Manning Valleys biggest natural attractions! For me, it’s one of my favourite waterfalls in the world. It’s especially cool that when you get to the bottom, you can stand under the spray and take cool photos atop one of the vantage points. But the falls aren’t the only reason to come to Elands. Here, you will also find a small community of artists and hippies who have decorated the tiny town and made it feel like home. Be sure to check out the Oxygen Farm Trail and The Rapids. At The Rapids you can slide down a naturally smooth rockface into the shallow basin below or just sunbake on one of the warm black rocks. Submitted by Castaway with Crystal. 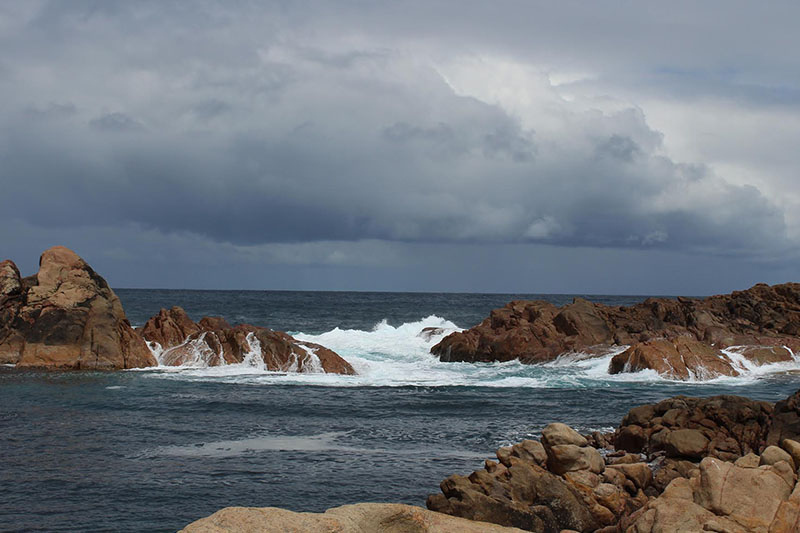 Narooma is located on the southern coast of the state. “Narooma”, which in Yuin (the Yuin are the Indigenous people of the south coast of NSW) for “clear blue water” is the only word to describe the sweeping views which greet you as you approach the coastal resort. Narooma boasts unspoilt, pristine waterways, seaside relaxation and an abundance of wildlife without the crowds. Old timber boatsheds line the estuaries, many providing fresh local seafood. Swim, drop a line, enjoy a cliff -side round of golf or simply relax in the sunshine. If you’re looking to have a bit more of an active holiday, here are some options. 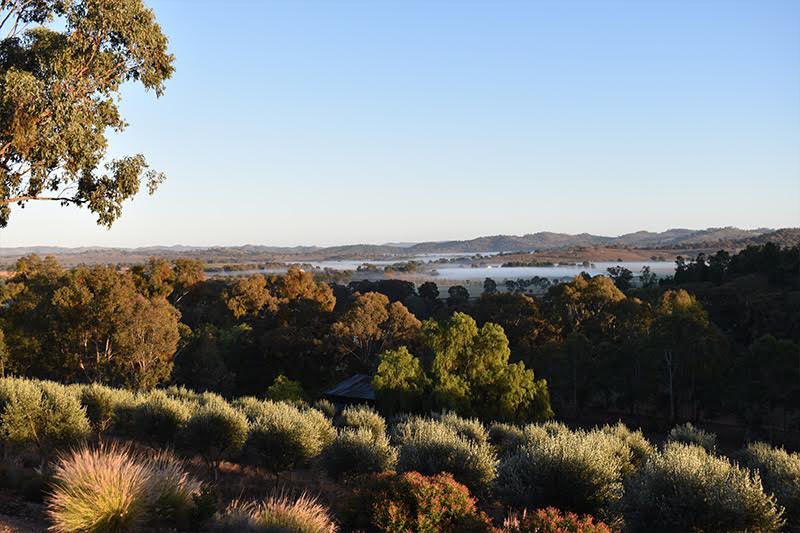 Explore historic Central Tilba nearby and learn the traditional history of Mt Gulaga. Visit Montague Island, a former lighthouse and now a nature reserve, home to a large seal colony and around 90 species of birdlife. A charter from the town wharf will bring you out to fish, snorkel or swim with the seals. Hire a boat and enjoy a day on the estuary fishing, swimming or just enjoying the scenery. From September to November the whales put on a spectacular display during their annual migration. Enjoy a whale watching tour, or simply view them from the many platforms along the 10 kilometres of scenic pathway between Dalmeny and Kianga. 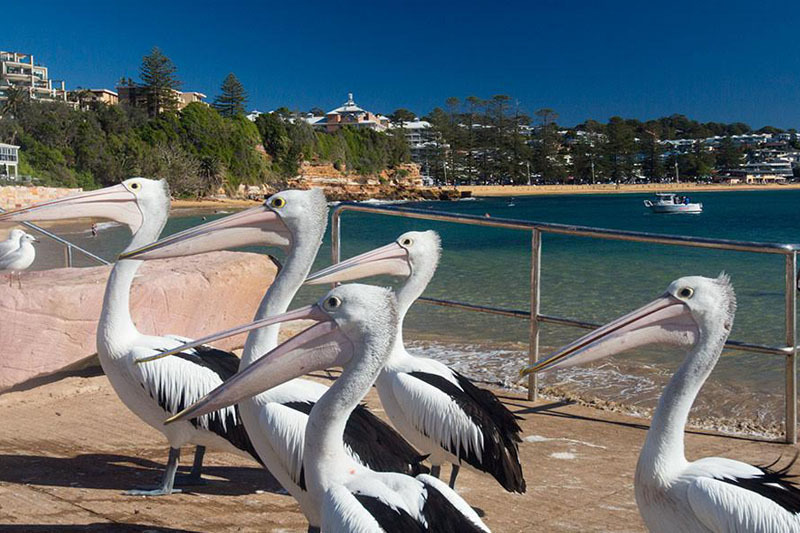 From the Mill Bay boardwalk or the many beaches, you are sure to catch seals or dolphins at play, stingrays or pelicans jostling for a feed and even the odd emu and kangaroo. 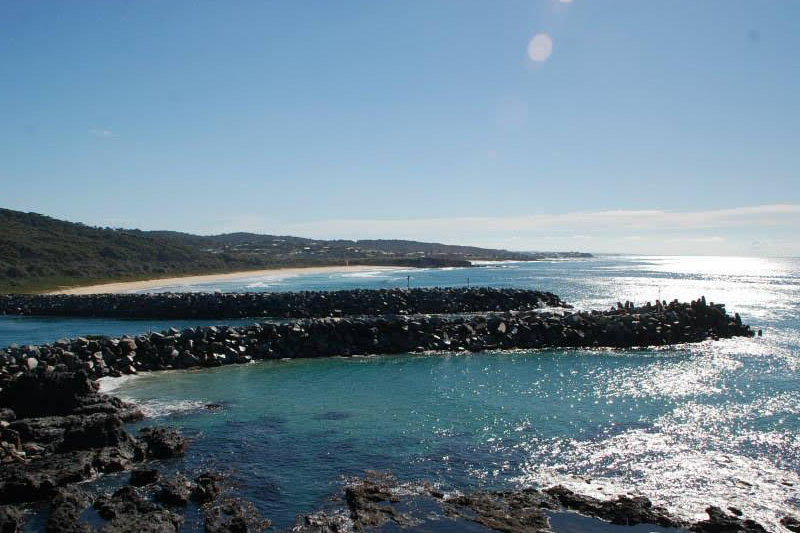 Narooma is truly an unspoilt paradise for a relaxing holiday. Thanks Empty Nesters Travel Insights for the contribution! Another picturesque location in NSW’s south coast. 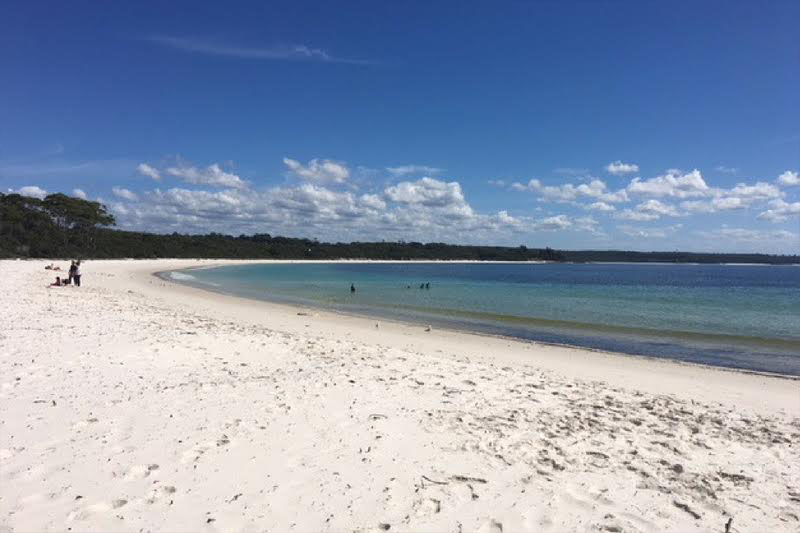 Jervis Bay, 207 km from Sydney on NSW’s stunning South Coast ticks all the boxes for a weekend getaway or longer. If you dream of silky silver beaches, turquoise blue water, dolphins, penguins and sea dragons and breathtaking vistas Jervis Bay is the place for you. You can enjoy a morning walk through the Jervis Bay National Park and you just may share the walking trails with a kangaroo or two. From May to November the whale watching season is underway and there are cruises available from Huskisson. If you enjoy scuba diving the Jervis Bay Marine Park offers up to 50 available dive sites throughout the year. 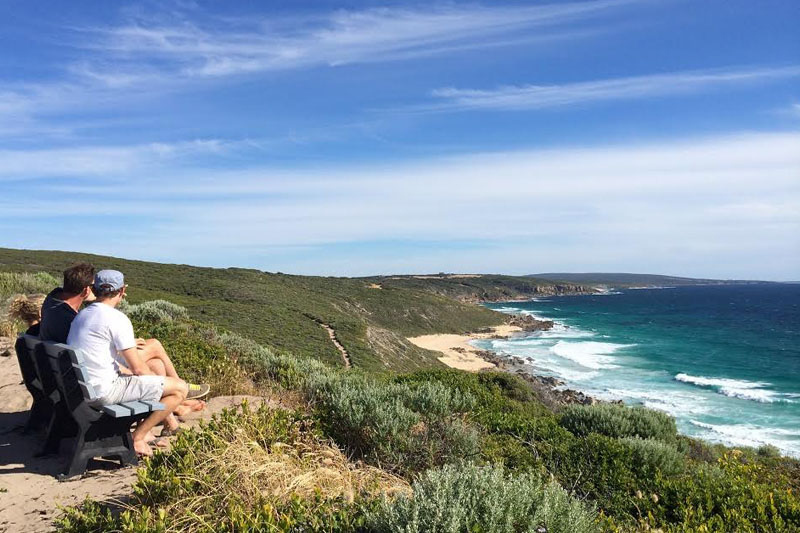 If camping is your passion and you enjoy secluded beaches and bays head to the Booderee National Park where 3 camp sites are on offer at Green Patch, Bristol Point and Cave Beach. 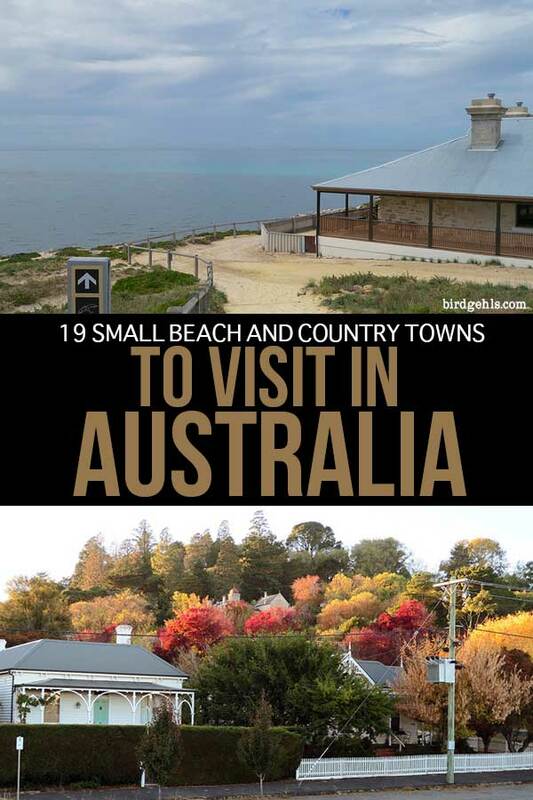 The seaside villages of Vincentia, Callala Bay, Huskisson and Hyams Beach offer all types of accommodation to suit all budgets. Over the past few years Jervis Bay and its surrounds has become well known for its culinary delights especially in the town of Huskisson. It will be hard to leave when your holiday is over. Courtesy of To Travel Too! Terrigal is one of the main towns in the Central Coast region an hour or so north of Sydney. It’s a great place to visit because of its beach and coastal scenery, and it’s one of the best bases from which you can explore the Central Coast. The Central Coast is really one big conurbation, a large swathe of Suburbia-on-Sea right on the doorstep of some incredible scenery and stretches of unexplored coastal wilderness. Terrigal is one of the most built-up parts, and has some of the best sand and coastline in the area. Terrigal Beach is fantastic, a long, dramatic crescent of glorious Pacific sand. Most of the town’s restaurants are concentrated around the southern end of the beach, along with the hotel and holiday apartments. The northern end around the lovely lagoon is much quieter. The best of Terrigal’s scenery is also at this end of town, including the small bay at the Haven and the Skillion, a dramatic headland and cliff with a beautiful park just behind. The next suburbs down from Terrigal are North Avoca and Avoca Beach, home to one of the best beaches on the coast. Further to the south, the Bouddi National Park is an unexplored gem, as is the Wyrrabalong National Park to the north. Thanks to Travel With Little One for contributing! Click here for more places to visit in New South Wales. The Town of 1770 (officially written Seventeen Seventy) is the site of the second landing of James Cook in Australia. Along with the nearby town of Agnes Water, it’s a great place to get back to basics amongst the beauty of the Australian coastline. It’s a relatively quiet area, but with plenty to do. You can try paddle boarding, kayaking, surfing, walking around the coast, plus boat trips around the coast and to the most southern area of the Great Barrier Reef. It has all the majesty of the north of Queensland, but still has the surf, which dies down as you head further north. The Town of 1770 is now a protected area and no further buildings are allowed there, so the nearby Agnes Water continues to expand and provides many of the accommodation options. There’s everything from campgrounds to hostels, cabins, and motels. If you’re looking for somewhere calm and relaxing along the coast of Queensland but with plenty to keep you occupied then head to 1770! Cheers to Migrating Miss for this entry! Airlie Beach is a little gem of a place that traditionally doesn’t see as many tourists as some of the other coastal Queensland towns, such as Cairns. 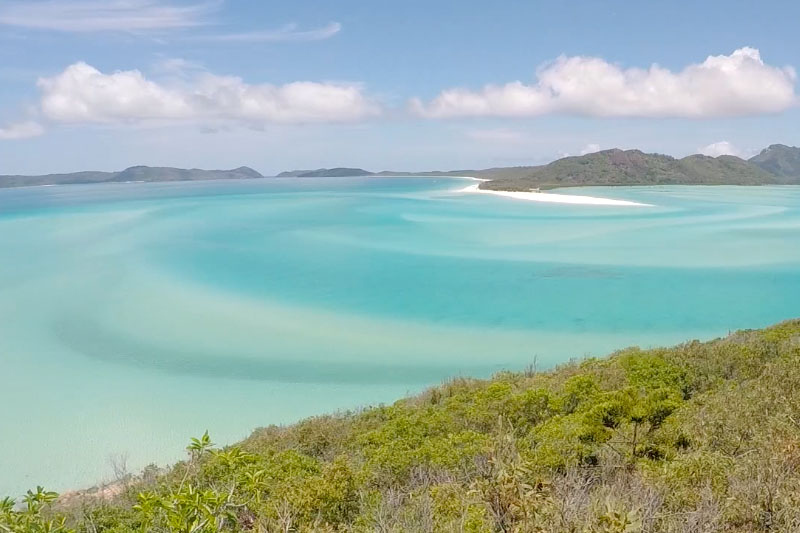 It’s is the gateway to the southern Great Barrier Reef and Whitsunday Islands and provides easy access to Australia’s most photographed beach, Whitehaven Beach. The town has a laid back vibe to it, making it popular with backpackers. The main street is where it’s all at and the esplanade holds a weekly market on a Sunday consisting of things that are all locally produced. This area does experience visits from saltwater crocodiles and has a bit of a problem with box jellyfish at certain times of the year but don’t let this deter you, particularly they have a beautiful lagoon on the waterfront, enabling you to swim all year round. Learn more about touring the Whitsundays here. Submitted by Our 3 Kids V the World. Inside the Comfort Inn in Coober Pedy. Yes. For real. Coober Pedy in Outback South Australia has got to be one of the most interesting town to visit in the country. Located 850 kms north of Adelaide, Coober Pedy is best known for being the opal mining capital of the world and for its residents that live in dugouts underground. There are no trees, little water and lots of red dirt hills strewn around the town area, making it feel a little like being on Mars. 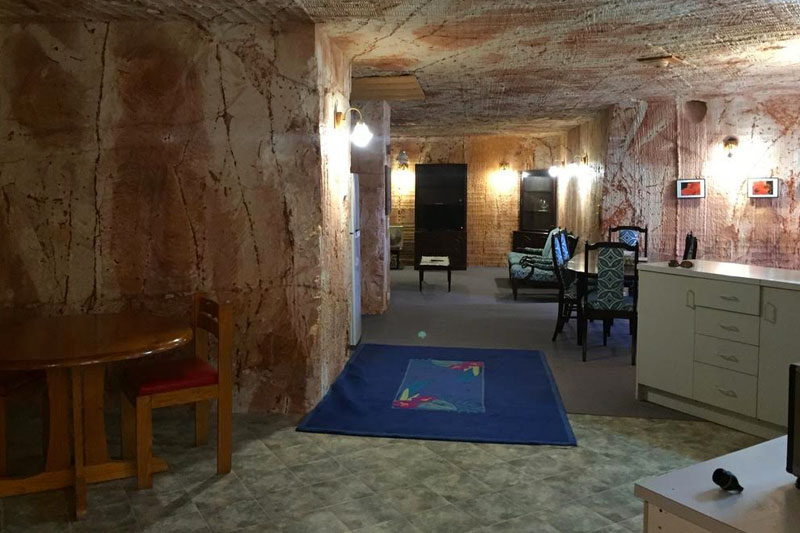 The one thing you have to do while visiting Coober Pedy is stay in an underground hotel. The rock walls provide natural air conditioning against the oppressive desert heat and sleeping underground is a surreal experience. You can also tour underground homes, including one with a swimming pool and underground churches and restaurants. Of course while in Coober Pedy you do need to go on a mine tour to understand how opal is mined before picking out a souvenir to take home. Here are some other ideas of what to do in Coober Pedy in 1 day. Submitted by 5 Lost Together. Margaret River is so much more than just a town. Tucked away in Australia’s beautiful southwest, Margaret River is synonymous with award-winning wine, world-class surf breaks and stunning scenery. While it’s the surrounding region which draws the crowds to the Margaret River area, the town itself has plenty to offer visitors too. Margaret River is named for the river that runs through it and while it’s still a country town at heart, there are plenty of hip and classy additions to this bustling rural township. The main drag along Bussel Highway is a growing hub of trendy cafés, boutiques, wine bars and galleries. For a classy night out, look no further than Must Wine Bar which offers sensational regional produce and wine. For traditional pub grub and a lively ambience, Settlers Tavern has been entertaining the crowds for decades and is still the best place in the southwest for live music. Another must visit, is the Margaret River bakery where the queues packed with gnarly surfer dudes and hipsters are well worth the wait, not least because of the kitschy interior and plush purple velvet seats. Not to be missed on any visit to Margaret River is a trip to the farmer’s markets, held every Saturday morning. The markets are the perfect venue to sample local produce, indulge in homemade delicacies and get into the community spirit. After all that, there’s the 100 plus wineries to explore, amazing breweries and of course those legendary beaches and gigantic Karri forests. Here are some other options for Margaret River which don’t involve wine. Thanks to West Australian Explorer for contributing! Looking out at the ocean from Rottnest Island. Beach towel, swimming suit, hat, sunscreen – check! If you’re looking for a beautiful and relaxing place by the ocean, then schedule a weekend getaway or a day trip to Rottnest Island. 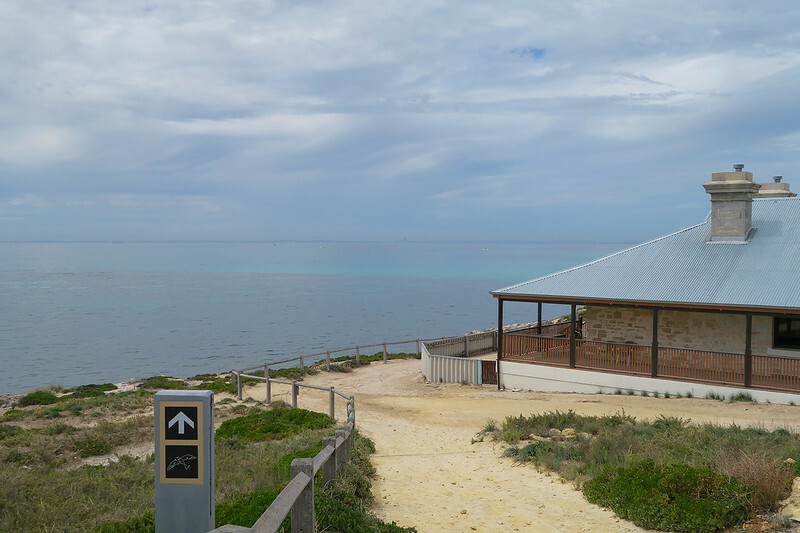 Located off the coast of Perth, Rottnest Island is accessible by a 1-1.5 hour one-way ferry ride. Some of the best things that you can do is relax on one or more of the 60 beaches on the island, swim, or snorkel in the crystal blue waters. You can also rent a bicycle to cycle around the island or take a hop-and-off bus tour to visit picturesque sites. We can’t forget about the celebrities on the island – the quokkas! The quokkas are adorable marsupials that are inquisitive and will walk up to everyone. You’ll find the quokkas in designated areas on the island, and around the Settlement Shops. If you’re in the Settlement Shops, stay alert for peacocks strutting around or visit several cafes for a break. We recommend a trip to Rottnest Island if you’re in the area. Submitted by Life Of Doing. Canal Rocks are located on the south-western coast of Australia. Tucked away in the South West corner of Western Australia is the beach town of Yallingup. The town boasts idyllic beaches with white sands and crystal clear waters, perfect for a cooling swim. For those sporty waterbabies the strong winds of WA and remote location can also mean you’ll have the oceans to yourself if you fancy a spot of windsurfing. Although it’s a small town in a very large country, there’s plenty to do in Yallingup. The cooler southern climate mean that there are wonderful wineries stretching all across the region, and Yallingup is no exception! Indulge in a tour of the wineries to see what tipple tickles your fancy and even take a souvenir bottle away with you. Yallingup’s location in the Leeuwin-Naturaliste National Park also means you’re not far from either of the capes, larger nearby towns, and the many caves throughout the park are a popular attraction to see some of nature’s most fascinating creations. The crown jewel of Yallingup is without a doubt, Canal Rocks. The crashing waves and red stones feel otherworldly, and clambering around them makes for quite an adventure. The rocks provide a rugged but breathtaking view of the coastline, and as a relatively unknown attraction you’ll likely find it people-free! All in all Yallingup has everything you’d need for a break away in the peace and quiet of the Australian countryside. With gorgeous landscapes and the freedom of space what more could you need? Read about road tripping from Perth to South West Australia here. Thanks to Suzy Stories for this contribution! Ripper sunset at an Australian icon. Yulara is a small town in Southern Region of the Northern Territory of Australia, which according to the 2016 census, has a permanent population of less than 900 people. It is also a popular tourist destination, as it is where most Uluru tours start from and it’s where all the area’s campsites and hotels are located. The town is structured around one main roundabout, with a central square around which all the shops and restaurants are located. From Yulara the entry to the Uluru & Uluṟu-Kata Tjuṯa National Park is a short 20-minute drive away. 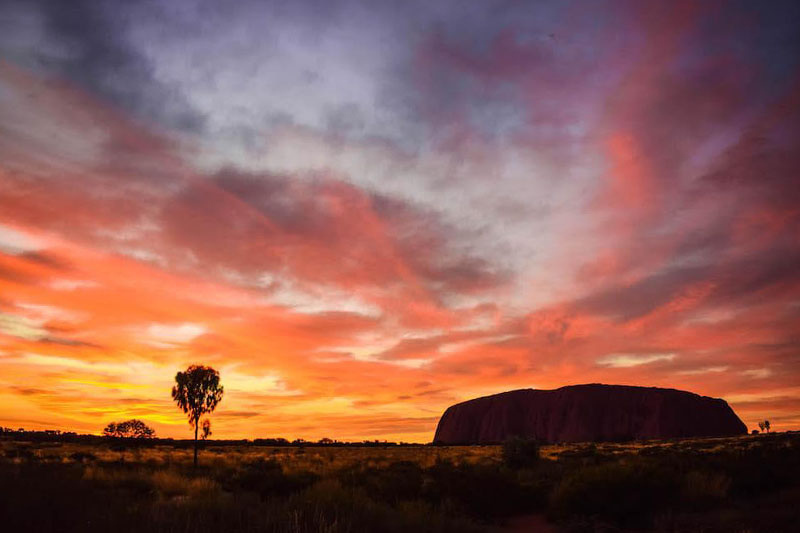 In town you will find a lot of tours that can take you to experience magical things such as the sunrise over Uluru, an evening at the Field of Light, or hiking in Kata Tjuṯa. While the town itself might be a bit quiet, there are plenty of beautiful things to see and do around it. Here are some more examples. Thanks to Greta Travels for contributing! 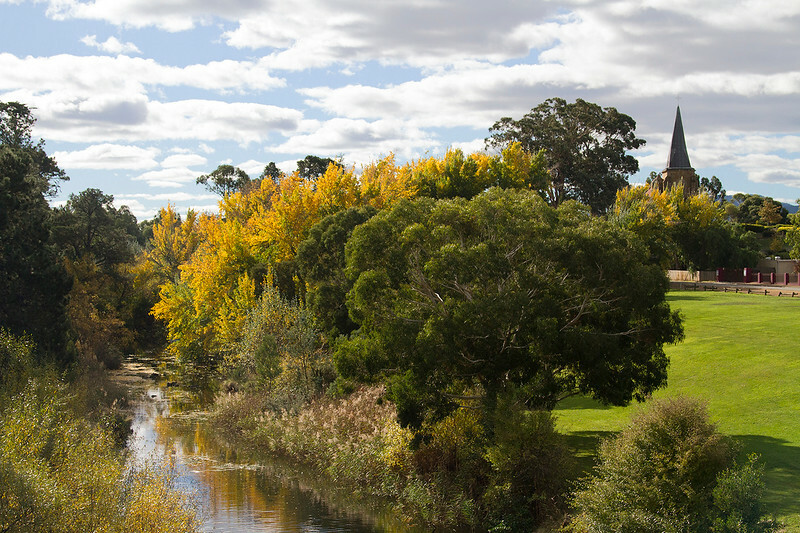 Beautiful Richmond is a must-see in Tassie (hey, that rhymes!). Located just 30 minutes away from the state’s capital of Hobart, Richmond is a gorgeous little town in Tasmania. With a population of less than 1000, this town has an old-world charm due in part to a lot of original colonial buildings from Tasmania’s convict past. It’s the perfect destination for a day-trip from Hobart because even though it’s small there is still a lot of things to do and see! Nestled in the Coal River Valley are numerous award-winning vineyards and restaurants around the town, as well as lots of lovely cafés within the sandstone buildings of the town centre. The old fashioned lolly-shop is a favourite among tourists and locals with huge glass jars of lollies on display on the walls, as well as tempting ice-creams on offer. You can walk over the oldest still-used bridge in Australia and watch the ducks, explore a massive maze or marvel at the tiny model of colonial Hobart at “Old Hobart Town”. 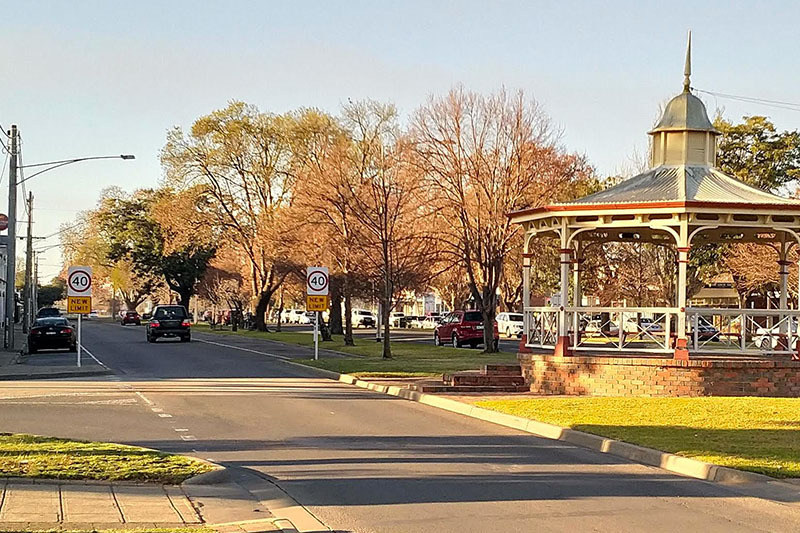 There is also the Richmond Gaol if you want to learn more about the town’s convict history and a charming village market on the local green every Saturday. There are art galleries and antique shops galore, and you can even dress up in old-fashioned clothing for a colonial photoshoot! Richmond is truly a lovely little town and well worth a visit. Here’s a full list of awesome things to do in Richmond. Cheers to Tassie Devil Abroad for this contribution! Check out these other small towns in Tasmania that are worth visiting. Have you visited any of these small towns? Would you like to? Let me know in the comments and please share this to inspire more Australian travel fun times. You can follow Birdgehls on Instagram, Twitter, Facebook and Pinterest for more travel inspiration for Australia and elsewhere. And here are some general travel tips for Australia. This is awesome! I’ve only heard of Melbourne and Sydney in Australia. It’s great to hear about some lesser known places and to get some info about those places too 🙂 Thanks for sharing! Really love this list! Definitely need to go back to Australia and check some of these out! What a lovely post! I bet Australian cities are really lovely! They are and the towns are even better! I feel the same way! Small towns are charming. From what Mark’s said, it sounds like it’s worth going there just for those pies! I think it probably got deleted in the great plugin purge of June! What a lovely title! What a wonderful list! I will come to Australia for studying university at the end of this year and I will definitely spend time to visit these towns. Thank you so much for your post!